Darwin Plants was founded in 1865 in the heart of the Dutch bulb district, under the name Witteman & Co. Over all the years, it remained a family runned business with the benefit of accumulated knowledge, experience and contacts built up over 4 generations. The company was originally formed as growers of flower bulbs, and started exporting these in 1930. Herbaceous perennials were added to the range in 1980, when the name Darwin Plants was introduced as a branding for these. In 2001, Darwin Plants became the official trade name for Witteman & Co., in line with a new branding program designed to make the company more easily recognizable. Today, Darwin Plants is Holland’s largest exporter of bare root perennial plants, with a firm foothold in North America, Europe and The Far East. When you become a Darwin Plants customer you reap the benefit over more than 150 years experience in the business. This means that we know how to store, package and transport plants to arrive at your company in optimum conditions. We are constantly updating our facilities in line with the latest technologies available to us. Supply over 1200 varieties of herbaceous perennials from a catalogue selection. New Introductions, best sellers and proven varieties. Source and supply varieties not listed in our catalogue by special request. Supply pot tags for plants listed in our catalogue. Arrange access to a huge photo library if you wish to make your own promotional items. 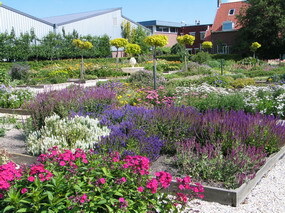 We maintain a large show garden on our premises in Holland, which you are invited to visit.